I got up early today, even though this would have been my first chance to sleep late in over a week, and went to the farmer’s market. And boy am I glad that I did. Not only was I able to rebuild my stock of lettuces, garlic, onions and potatoes, (all of which I used up before we left for DC), I was also able to pick up some blueberries and some very amazing blackberries, but I also found something that caused me to go into an intense craving: okra. A lot of folks don’t like okra, but I am not one of them. Which is odd, because one of the few food textures that I really object to is a slimy, mucilaginous one. And okra can very much be slippery and sticky. But, I have found that I like it three ways: in gumbo, the spicier the better, battered in cornmeal and fried in bacon grease, which is the way I grew up eating it, Southerner that I am, and cooked with tomatoes, onions, garlic, and spices, the Indian way. Of course, I have never made bhindi masala, so that complicated things somewhat. But not much. I never let little things like that get in my way. Okra is an interesting plant. Related to marsh mallows and hollyhocks, it is a pretty plant that originated in Africa, most likely Ethiopia. The part that is eaten is the young seed pod, and it secretes a very thick, somewhat slimy juice. I have found, however, that cooked the Indian way, the slime factor is reduced greatly, just as frying it in cornmeal seems to manage. With gumbo, the juice is used to thicken the soup, so it comes in handy, and if you put enough seafood, tomatoes, spices and chiles in the soup, and serve it over rice, I have found that I don’t really care about the sliminess at all. It is filled with both soluble and insoluble dietary fiber, it is loaded with vitamins C and A, and has B complex vitamins, iron and calcium as well. (Cooking it in a cast iron pot as I did boosts the iron level up even furthur.) It is also very low in calories, and when cooked the Indian way, tastes divine. If you have never tried it, or only had it boiled into a slithery cthuloid mess and thus think it is nasty, give it a shot cooked as a masala. It is much, much better this way, and really does make a great side dish along with rice, kheema sookh and raita. Because, as far as I am concerned–it is magic. And it took my okra masala and pushed it right over the edge from pretty good to downright amazing. It didn’t really taste like the way they make it at Shere e Punjabi, but that is okay, because it tasted better. And I have Indira to thank for that. If you don’t have access to dalia powder, sprinkle a bit of garam masala on the dish at the end of cooking. 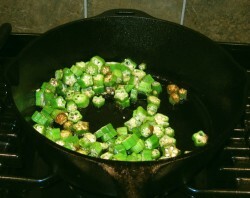 Heat the oil over medium heat in a cast iron skillet and drop in the sliced okra. It will sputter and sizzle and spit; this is because of the moisture in the okra. If you have a splatter screen or shield, I suggest using it to cover the dish while the okra fries. If not, be prepared to clean your stovetop well after this exercise. 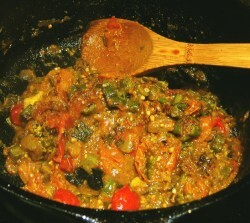 Cook, stirring now and again, until much of the okra has crisped and browned, and is emitting a wonderful, nutty aroma. Remove the okra from the oil, and drain on paper towels. While the okra is cooking, grind the ingredients of the spice mixture to a fine paste. Put the onions in the oil, and cook, stirring until they turn golden brown. Add sliced chile, and continually stirring, cook until the onions are deep dark reddish brown. Add spice paste, and cook, stirring until it is fragrant–about one minute. Add okra back to pan, and cook, stirring for another minute. Add tomatoes and water, and stir to combine. Turn heat down to low and cook, stirring now and then, until most of the water has evaporated, leaving behind a thick, yellowish curry of melted tomatoes and browned okra and onions. Sprinkle with dalia powder or garam masala and mix in roughly chopped cilantro. Serve immediately with rice, raita and whatever other dishes you like–for vegetarians, a dal would be great, for us, we had kheema sookh. My dad always fixed okra. I can only cook it when he visits as my husband doesn’t like it. I sure do. I need to confess – I’m terrified of okra. There are a few foods I’m highly sensitive to (as in, I have some sort of unpleasant reaction.) Strawberries, pineapple, and eggplant head the list, and unfortunately all kinds of legumes. I’ve never tried okra, but when I look at it I have the sense that if I tried it my tongue would swell up and I would suffocate. Isn’t that weird? I have no desire to ever test my suspicion, I just stay away from the stuff. Not that any of that has anything to do with your recipe, which sounds delicious despite the okra. I adore Indian dishes. As long as they don’t have eggplant or okra. 🙂 And I do appreciate your brief history of okra. I’ve wondered about it, as a food. Krisit–follow your instincts. Because it is a member of the mallow family–a family of plants that can cause strong allergic reactions in some people, okra -can- induce reactions like you describe in some sensitive people. Oddly–when I work with hollyhock plants–picking japanese beetles off of them to keep them from being eaten up, transplanting seedlings or harvesting seeds–if I brush too much against the hairy leaves, I will break out in hives. Hollyhocks are also members of the mallow plant family, many of which are known to cause dermatitis allergies in susceptible people. However, okra does not cause this, nor any sort of reaction in my mouth or throat. It never has. However, I do know people who have had their throats develop a rash and start to swell after eating okra. So. My advice to you, is to listen to your instinct, and do not eat okra. Since you like okra, there is a ‘must try’ dish- okra pachadi, a South Indian raita recipe (Kerala)…and since Indira has started taking you southward…I use Madhur Jaffery’s recipe from A Taste of India. Fried okra, a little onion, some fresh coconut, and the usual Southie tadka with yoghurt. As the okra sits in the dahi, it imparts a great colour and absorbs the liquids, thick mouthwatering raita…zero slime. I am catching up with all the reading at your fantastic blog. Read the piece on “Meat Comes From Animals…” the other day. Made the husband read it as well (he is a vegetarian). I don’t need to say it, it has already received official recognition. You do go all out! When we have okra here it’s generally just cooked gently with some onion and a sprinkle of cumin. This is the only method that Dan and I have reached agreement on. Growing up I always had overcooked okra which was incredibly slimy but would generally eat it anyway! I’ll agree that when I first saw the word “okra” I recoiled in disgust at such a slippery little item. But then you brought back memories of fried okra. I could stuff myself silly with some friend okra and hush puppies right about now! I hated okra until I made it this way – first about two years ago – and fell in love. I second also Anita’s recommendation for the okra pacchadi – it’s yummy! First, Barbara, must say say how much I enjoy both your writing and your recipes. Now about okra; specifically, the slime factor. First, to prepare slime-free whole [fresh] okra, carefully trim the stems without cutting into the pod and exposing its hollow seed chambers. Then simply steam the pods briefly, and dress with melted butter or perhaps a few drops of olive oil. Yummy AND nutritious, and no slime at all! Second, to ensure that your gumbo is never slimy, here’s a trick I learned by watching chefs on early-morning tv shows from New Orleans, and from reading old Creole cookbooks. Instead of cooking the sliced okra in the roux along with the “holy trinity”, pre-cook it separately in a heavy (preferably iron) skillet with a bit of bacon fat or olive oil over fairly high heat. Especially if using fresh okra, slime will flood the pan, causing momentary panic because clearly it will never go away! But it does – eventually – and while I can’t tell you precisely how long this takes (maybe 8-10 minutes? Longer? Who knows? ), be assured that if you keep cooking and stirring, at some point the ropes of slime will vanish like magic, and you can then add the okra to the gumbo pot without fear of creating inedible goo! Wow, thanks Barbara! Very interesting. I had no idea that the mallow family (like the nightshade family, I believe) was known for causing strong reactions in some people. Good job for trying a dish you’ve never done. Okra cravings must be satisfied! I am trying to learn more complex Indian dishes, as that is one of my absolute favorite cuisines. So far I am great at the easy chana masala, but that’s about it! Kristi–you are welcome. The only reason I knew that is because I have a friend who was having problems with okra making her throat go red and itchy and swollen and raw feeling after she ate it, so I looked it up, just a few weeks ago and found out about the contact dermatitis issue. I am glad you are enjoying the blog–it is always good to hear that certain posts “speak” to people. Scheherazade–yeah, I get into cooking and go “all out” sometimes. To me, this was a pretty simple preparation, though. Not too hard, really. Not now that I am used to using the Sumeet and cooking Indian foods from scratch. Of course, Indira’s Magic Powder does help…. Risingsun–I love deep fried cornmeal coated okra. That, and fried green tomatoes in one meal is just divine. Of course, I also know that the hit from the oil and fat is just tremendous in such a combination, but it is SO GOOD! So, I have it maybe once every other year or two. Just to remember, you know. Hushpuppies would be great with that, too…. Popeyemoon–I have never made it that way. I should have to try it. It involves bacon grease, after all–how can it taste bad? 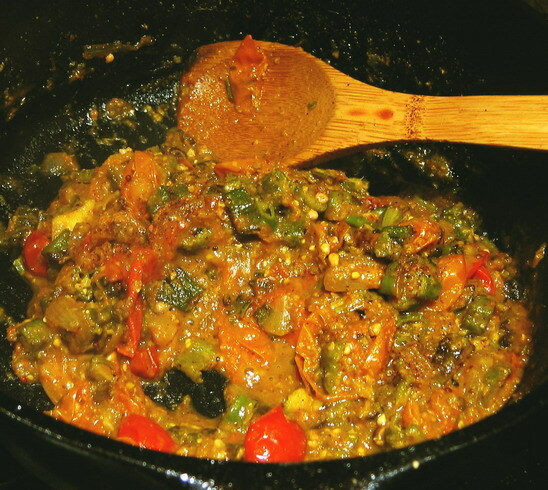 Diane–I know lots of people who hate okra, who have it Indian style and instantly like it. It is not surprising–the flavors are incredible. 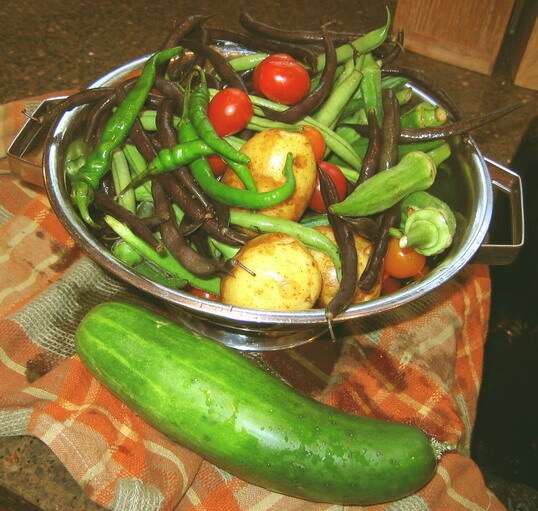 Cathy–that pre-cooking in an iron skillet trick–I suspect that is the point of all of the bhindi masala recipes I have looked at that suggest either pan frying or deep frying the okra seperately -first-. I have -never- had slimy okra from an Indian cook or chef. Never. And I suspect that the pre-frying step is the reason. It does release the slithers and then the slithers go away, and all you are left with is browned, crispy okra. Glad you are liking the blog–thanks for stopping by and commenting! 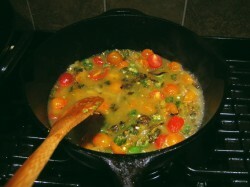 Julie–it is a matter of taking incremental steps in learning Indian foods. Eat a lot of good Indian food either at friends’ homes or in really good restaurants, and start training your palate. That helped me immensely. Eating thoughtfully and consciously at Akbar in Columbia, where I paid attention to the flavors, the textures, the heat levels, the aromas, is like a culinary boot camp for the senses. It is a mini-course in the flavors of Northern Indian cookery, and is a large reason why I can cook Indian food as well as I can. Eventually, I learned to parse out the flavors–and to this day, every time I eat there I learn something. On this last trip, Zak got mattar paneer and praised it as the best he had ever tasted–and he said it tasted like no other mattar paneer he had ever had. I tasted it–it was browned onions. A lot of them, browned, and then ground into a paste, that made the sauce so intensely richly flavored. It was the dominant flavor and the sweetness of the onions picked up and carried the sweetness of the peas and the mild sweet flavor of the paneer as well. I am a northern gardener who starts okra plants indoors in late winter, and with luck gets results in summer. ..This year our exceptionally rainy summer hasn’t helped, but this week, I harvested a few pods. I grew up in the south and love fried okra, cooking it as you do. Like popeyemoon I pick it and eat it immediately. My friend, Lydia,knowing of my okra cravings (which she does not share) alerted me to your blog. Her blog is http://www.theperfectpantry.com. Each entry is an extended look into an item from her pantry, complete with recipe. I am delighted she linked me to yours, I thoughly enjoy it, and look forward to reading more entries. Marcia–thank you for posting, and welcome! I am glad Lydia sent you here! I have never grown it–even my grandparents didn’t grow it, but they traded other vegetables with the neighbor across the road who grew it. Shared your recipe with one of my readers! Thanks….. This looks good! I love Indian food. Very nice recipe…its nice to see you have tried out indian recipes.